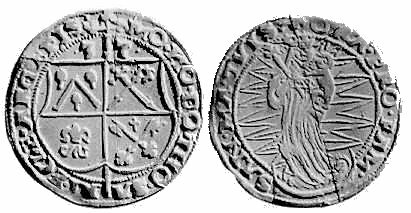 The silver content in schillings was reduced from 281 to 187.5 fineness in 1525. Therefore the relation between denominations was changed: before 1525 ferding = 9 schillings, after 1525 ferding = 12 schillings. For the first time the Archbishopric of Riga introduced new denomination, mark. It was struck just in very limited amount. Still the basic denominations were pfennigs and schillings. 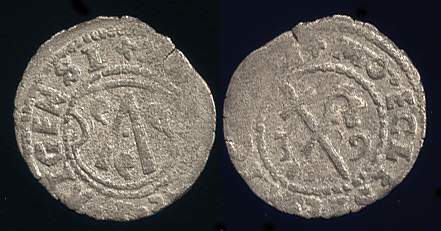 Archbishop Thomas Schoning was the first, who began the dating of coins. Besides that, his coinage can be recognized by his family shield. Thomas Schoning moved his residency to Koknese in 1528, because of the conflict with Riga City and the Order of Livonia. Description: Obv: Family shield of Thomas Schoning within shield. Dotted circle around. Rev: Date 3 7, divided by crossed cross and sceptre. Dotted circle around. Description: Obv: Family shield of Thomas Schoning within shield. Rev: Crossed cross and sceptre. Description: Obv: Family shield of Thomas Schoning within shield (different shape). Rev: Date 4 0 divided by crossed cross and sceptre. Description: Obv: Vertical sceptre dividing big shield, consisting of 4 fields with family shield of Thomas Schoning, Archbishopric, Riga domcapital and Riga city. Date .3 7. above the shield. Rev: Standing crowned St.Maria on the crescent. Children on left hand, cross in right hand. Rays in background.